[CONFSERVER-39852] Confluence installation on Windows fails with an error "Could not use bundled JRE. Please send this log file to your software vendor:" - Create and track feature requests for Atlassian products. 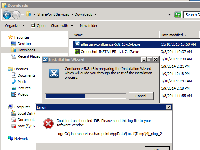 Confluence installation on Windows fails with an error "Could not use bundled JRE. Please send this log file to your software vendor:"
Run the installer on a Windows system. Installation completes successfully using the built-in JRE. "Could not use bundled JRE. Please send this log file to your software vendor: Log: C:\Users\Username\AppData\Local\Temp\i4j_nlog2"
Follow How to switch from the bundled JRE to System Java when using Confluence as Windows Service to update the JRE. The article refers to tomcat7w, however, this version of Confluence runs on tomcat8w. Replace tomcat7w with tomcat8w. CONFSERVER-39872 Confluence 5.8.16 installation on Windows fails with an error "Could not use bundled JRE. Please send this log file to your software vendor:"